You (Businesses and Organizations) cannot properly take advantage of the digital transformation without a scalable and repeatable identity strategy. Without it, you have no way to identify and engage with your customers in a meaningful way. Using Identity to get to know your customer. By using real-time context to create a single overview of the customer, you can offer better, personalized service based on real buying habits. This builds lasting customer relationships – and more importantly, trust. Securing identities for global Fortune 1000 companies, across cloud, mobile, and devices and things (IoT) – whether a laptop, mobile phone, table, citizen portal, connected car, healthcare wearable, or connected home device. Implementing a common identity platform company-wide, in order to share valuable data across the entire organization for better customer engagement. Scaling and externalizing your identity platform to accommodate customers, prospects, partners, and citizens. 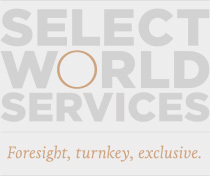 JOIN the executives in the group below for senior-level conversations, exchange of ideas and networking at Select World Services’ Exclusive, intimate, by invitation only CXO dinner – Digital Transformation.